This is the result of a collaboration between Transubstans Records, Russian act VESPERO and German act ZONE SIX. The first three tracks of this record consists of the atmospheric soundscapes of psychedelic space rockers VESPERO; a band that combines playfulness and joy with futuristic heavy rhythms. The great recordings of their works has helped capture their essence; a tight, thick wall of sound, allowing them to give synthesizers the space they need in songs like this. To sum VESPERO up: a great band whose work is very “airy” yet concentrated from time to time. You will be surprised! 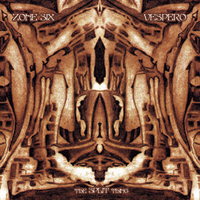 ZONE SIX is a band built up by members from the more outstanding psychedelic space rock scene in Germany. Some of the keys in the band is Dave Schmidt (ELECTRIC MOON, SULA BASSANA) on the drums and Komet Lulu (ELECTRIC MOON) on bass and effects. Komet Lulu is also the mastermind behind the cover of this record. Combining different members from some of the best bands in Germany today (ELECTRIC MOON, THE PANCAKES, VIBRAVOID), ZONE SIX manages to create an extremely atmospheric sound that will explode deep down in your veins. Their featured track on “The Split Thing” is called “Babapapatantramanta” and provides the same hypnotizing emotions like the HAWKWIND albums of the early 70’s did. Highly recommended!